Saxen’s Strindberg Museum is the only museum outside Sweden dedicated to the world-famous author. varied, providing insight into this previously uncharted stage of the Swedish author’s life. marriage to the Upper Austrian Frida Uhl, and the significance of his work for modern literature. The subject is presented in a scientifically accessible way. 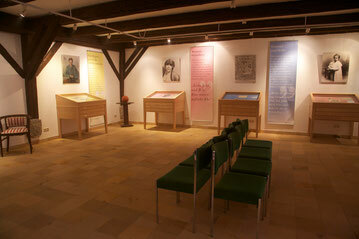 The museum houses original letters, manuscripts and contemporary photographs (from Strindberg himself, among others). description of his journey through a ravine. Sound and video technology combine to reconstruct a passage from the novel Inferno. Strindberg was seized by fascination and fear the first time he saw Frida Uhl standing in front of him in a clinging green dress. This showcase presents the varied relationship between Strindberg and Uhl. A previously unknown photograph shows Frida Uhl as a schoolgirl at a convent school. The museum houses Strindberg’s original letter to FridaUhl’s father, asking for his daughter’s hand in marriage. Also on display is the crushing, furiously jealous letter, which was a contributing factor towards Strindberg and Uhl’s eventual divorce. In August 1893, Strindberg visited Upper Austria for the first time. A sketch and many original photographs shed some light on the family he met at their summerhouse in Mondsee. Marie Weyr, a journalist like her sister Frida Uhl, praised Strindberg’s resourcefulness, but lamented his attitude towards women. The exhibition contains Strindberg’s original letter from Salzburg shortly after his abrupt departure from the summerhouse. The letter shows that he felt a strong connection to the deeply religious stepmother of the family, Marie Uhl. Strindberg lived with Frida Uhl in Dornach, Saxen, from November 1893 until August 1894. A previously unknown notebook shows that Strindberg remained working on literature despite his new involvement in natural sciences and painting. Altogether, he composed around a dozen essays (Vivisections) during his time in Dornach. In May 1894, Frida Uhl gave birth to the couple’s daughter, Kerstin. We see Kerstin as a baby on the earliest remaining original photograph. Among the most remarkable exhibits are the two self-portraits of Strindberg at his writing desk. Strindberg’s final trip to Saxen in the autumn of 1896 was for his daughter Kerstin’s sake. Old photographs and picture postcards bring to mind the houses that Strindberg lived in at the time. He moved house many times, which shows us how nervous and restless he was during this period. In an original letter, Strindberg describes a brush with the occult one night in Saxen. A life full of misfortune lurks behind the seemingly harmless title of Frida Uhl’s memoirs. After her divorce from Strindberg, Frida Uhl had a brief relationship with the author Frank Wedekind, which resulted in a son. Because her career as a journalist and translator didn’t bring Frida Uhl the success she expected, she became very depressed for a while. However before World War 1 she set up a successful cabaret in London hosting literary giants such as James Joyce. The museum thanks a patron from New York for donating an original cabaret program. This is the extreme ways in which Strindberg describes his autobiographical work. Sketches and tables show the background for his move towards the “anti-naturalistic” in the 1890s. The play After Damascus deserves special attention; it contains many references to Austria and inspired famous dramatists from Samuel Beckett to Botho Strauss. In the winter of 1893-1894, Strindberg used his relatives’ money to purchase a piano. He was a Beethoven-lover who allegedly sung in a “bass drone”. A year later, Strindberg was being pestered to repay his debts. His response from Paris, implicitly directed at Frida Uhl’s grandfather, was “If that old shark wants his 200 Guilders, then let him sell the piano”. Fortunately, the instrument remained in Saxen and can be viewed in the museum today. The highlight of the exhibition is a six-minute multimedia installation. Strindberg’s “hellish” journey through the ravine between Saxen and Klam, as described in his novel Inferno, is realized using contemporary photographs, sound, light, and video sequences, as well as drawings from Strindberg’s diary. An extract from Inferno serves as the backbone of the piece. A room adjacent to the museum is decorated in turn-of-the-century style. This is more than simply a reconstruction of Strindberg’s writing environment. In this way, the room illustrates Strindberg’s creative method to the viewer. The photograph “Donauinsel vor Dornach” shows a small island in the Danube by Dornach. Initially, Strindberg painted the island with the title The Danube Bursts its Banks. Through his soul-searching letters, this image gained the connotations of the Biblical Flood. Finally, in Strindberg’s play After Damascus, the flood became a symbolic punishment for the greed and corruption among families in Dornach.